Fort Fido Dog Daycare & Boarding News Blog: Joyful Jack! 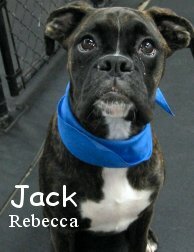 Joining the ranks of the Fort Fido Boxers today was Jack. Even though he is just six months old, Jack is already almost fifty pounds! He is going to be a big boy when he finishes growing. Jack played in the medium roll with two other six-month-old Boxers, Stella and Jasmine. All told, there were five Boxers at the Fort today! Jack settled in nicely into the daycare environment, and played happily on and off throughout the day. This morning, Jack was caught on camera playing with a Husky named Polo. Jack made a great addition to the pack, and we welcome him back anytime! Please welcome our newest Buddy! A Dose of Doggie News! Welcome Hannah, and Happy Birthday Logan!